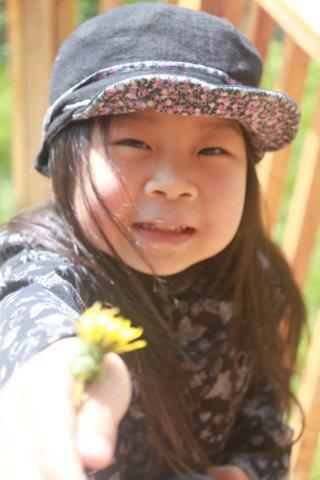 When my daughter was two, she hunted for dandelions in our yard. The bright yellow flowers delighted her and she would grab handfuls of them for me and insist that I place them in vases throughout the house. At the end of a dandelion’s flowering days, Kyra played a mischievous game, where she raced to blow apart the seed-bearing parachutes before mom and dad could catch her. She would collapse into giggles as the wind picked up the parachutes and transformed them into dandelion snow. Then, she would leap into the sky, hands grasping for the wispy seeds that danced above her long black hair. I think when I was her age, I loved dandelions too. My mother had plenty of photos of me blowing apart a dandelion clock. But somehow, thirty years later, I had joined ranks with the dandelion killers. Maybe, I even helped my husband buy weed killers and tools like the Dandelion Digger, the Weed Hound, or the Dandelion Terminator that would pluck them out at the roots. Recently, during my interviews of local healers in the area for a forthcoming First Alaskans article, I learned that dandelions are edible, a nutritious source of calcium, iron, and vitamins A, B, and C. The flowers thrown into a bath helps relieve muscle tension. The roots made into decoctions and tinctures can lower cholesterol and high blood pressure, a condition that affects many in my family. How had I missed such a vital piece of information? Were dandelions prolific in my garden because we needed their medicinal properties? Had we poisoned the store right outside our doorstep? What bothered me most was whether I was a hypocrite. Subsistence and wildcrafting are traditions I encourage and try to practice in an urban environment, but clearly, I had a lot to learn. With natural disasters like Japan’s recent earthquake and tsunami in mind, I worry that none of us knows how to survive without electricity, technology, and other modern conveniences. Hike with guidebooks like Janice Schofield’s Alaska’s Wild Plants: A Guide to Alaska’s Edible Harvest or Alaska Native Tribal Health Consortium’s Traditional Food Guide for Alaska Native Cancer Survivors. Harvest plants with someone who knows what they’re doing. Observe how they harvest, prepare, and store the plants and what they use them for. Consult with sources like the Alaska Community Action on Toxics to make sure we aren’t harvesting in areas that are polluted or sprayed. Teach my children to respect others by being nice to plants. Show them how to give freely and tell them stories about how when you give, it always comes back. If we go berry picking, I will instruct them to take only what they need. If they catch their first fish, they must give all of it away to an Elder or someone in need. What do you teach your children about plants and animals in the Anchorage area?